At the end of last year I extended my ratings to the individual disciplines, so you get a better picture of where each athlete’s strengths and weaknesses are. This also allows me to get a more detailed look at how the race might unfold. 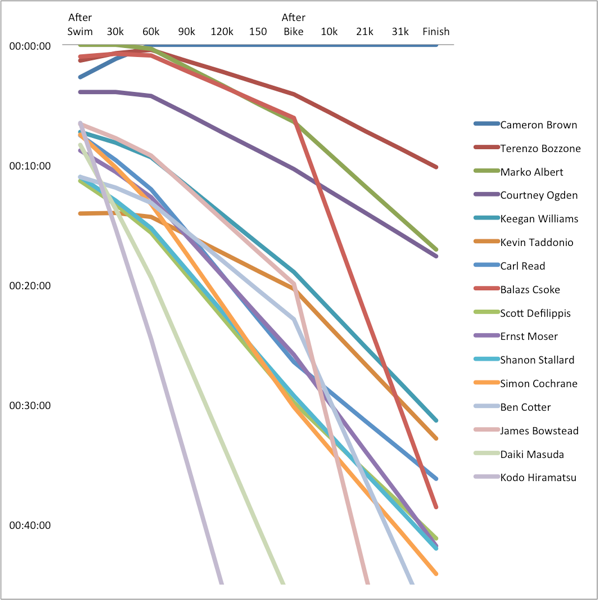 I think that the graphs give you good picture of what a “typical” race between these athletes is going to look like – and I hope that you will also be able to quickly spot if an athlete is doing much better (or worse) than what could be expected. 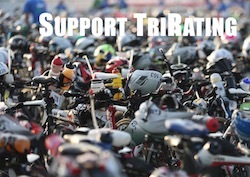 Of course, there is still a lot of room left for speculation: Is athlete A going too fast on the bike (so he will blow up on the run – think Marino in Kona)? Athlete B is a great runner, but can she can afford to give up that much time on the bike (for example, Rinnie)? A (little) qualifier: Of course, this is just based on “pure” numbers. This does not take “race dynamics” into account. 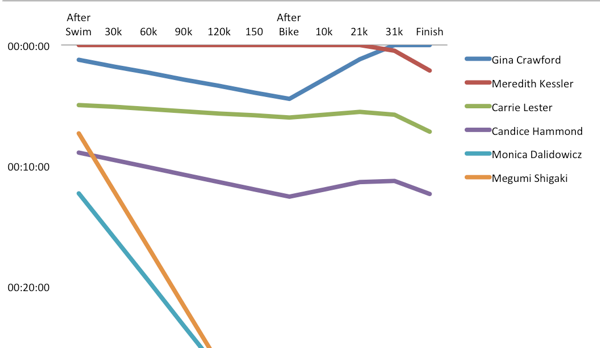 I’m pretty sure that there will be little groups during the swim and bike and that the athletes in these groups will finish closer together than the pure numbers indicate. Also, there is no (statistically valid) way that I can predict the performance of the new IM athletes – therefore they are not included in the graphs. Especially the performance of Bevan Docherty is offering a lot of room for speculation. Marko Albert will probably lead after the swim. Terenzo and Balazs Csoke won’t be too far behind, maybe they will form a group to properly distance Cam Brown who will be 2-3 minutes behind. All the other Pros will be around 10 minutes back. The field will take about 60k on the bike to sort things out. Cam will probably take the lead by then – but again race dynamics might come into play and Terenzo and others may try to stay with him. Of the top athletes after the bike Balazs has the slowest run rating (3:27, and therefore will probably loose a few spots). But his run results have been pretty mixed and his last run was a 3:07 in Austria), so he may be able to surprise. Other than that, the run could turn out to be pretty boring – the graph shows that only the race for 3rd place may be close. Meredith Kessler will lead after the swim and is probably going to extend her lead over Gina Crawford on the bike. Gina is the best runner in the field, based on the numbers she will take the lead just before the 30k mark. However, with a projected winning margin of just around two minutes anything can happen on race day. Carrie Lester and Candice Hammond won’t be too far behind, so if Gina and/or Meredith run into problems, they’ll be ready. Even with the smaller women’s field, I still have four athletes within 10 minutes!